The last time we experienced a 3 global year was 2001. The Bush era was already underway and, in the double 3 energy of September that year, the evolutionary numbers 9 and 11 became infused into a shocked human psyche. The circumstances of 2001 delivered a massive wakeup call to humanity. But there was just so much going on, in a short space of time, so many shocks to the emotional and mental system, so much fear and confusion, resulting in unnecessary war, political mayhem worldwide, and great losses of life and freedom. 3 represents COMMUNICATION and THE POWER OF WORDS AND IMAGES, and it will become obvious in 2010 just how formidable communication is as a weapon with which to control hearts and minds – or – a means of helping to set hearts and minds free. Our wake-up call is not over – which means that parts of us are still asleep! But the events and circumstances of 2010 can broaden our horizons, move our feelings, stretch our minds and open our hearts. New beginnings emerge from endings. That’s the ever changing process of life. 3 is the number of popularity, pop-culture, population, people. Politics cannot help but turn ‘populist’ in 2010 – an approach which claims to work for the good of the people, rather than the ‘elites’. It will be interesting to see how that plays out since all political parties claim to act in the interests of ‘the people’. And, this year, unlimited funds will be poured into communications – words and images – to sway us towards a particular point of view. This WAR OF WORDS will deeply affect all of us, no matter where in the world we live, because of the multi-national status of corporations. On January 21, the Supreme Court of the United States enacted a law which allows corporations to spend unlimited funds on political communications. This is an assault on personal freedom and free speech. When the corporations have more rights than people, that’s fascism. This new law is not only a matter of who gets to be heard but, given the money and influence that the corporations have, it is also a matter of who gets silenced. The enactment of this new law occurred on January 21, 2010 (1+3+3=7). The devastating Earthquake that hit Haiti occurred on January 12, 2010, which also translates to (1+3+3=7). 1 is the number of change, beginnings and the individual. 3 provides optimism. 7 brings pessimism. The 3 roller coaster has begun and, let’s hope that the old saying that ‘disasters happen in 3’s’, is not an absolute fact. WORDS have enormous power, but they have been misused terribly in recent years, to the extent that some words have entirely lost their meaning. When the right group of words are expressed in the right way, at the right time, and to the right audience, the entire direction of our lives can change, for better or worse. In 2010, and from now on, our choice of words is going to play a major role in our lives. Not just the words that we ourselves speak, but also the words of others that we choose to trust. A courageous but different attitude is needed. Instead of giving up and allowing corporations and banks to take over our lives completely, we can resist in a way they can do very little about. This involves the healing and strengthening of our emotional energy so that our feelings cannot be preyed upon and manipulated. The rise of the human Will is occurring so rapidly now that those who have been controlling life on Earth are taking drastic measures to curtail it. Of course, this 3 global year will not take the same route as the last one, not only because the zeros have shifted position, (the shape of 2001 is not the same as 2010), but also because people really have learned a lot about what’s going on in the world since then. We evolved significantly, both emotionally and intellectually. We also experienced a profusion of intense energy in 2009, an 11 global year in the world and, in particular, intense 11:11 energy in November, and strong blasts of 11:11:11 on November 11 and 29. Those were evolutionary gateways into the future which were filled with insight and enlightenment, all of which can be of great help to us in 2010 and beyond. There are links to my 11:11 articles at the end of this page. It is time to grow up, brothers and sisters, and we need to do this not just quickly, but right now. In 2010, no matter what our age, gender or position in life, the child within each of us must reach new levels of maturity and courage. Growing up not only means waking up to reality, but also healing from those childhood traumas, disappointments and confusions that held us back from maturity by keeping us locked in the past. This healing process must pick up speed now. The sense of urgency that many have been feeling for so long is becoming stronger as we realize that good intentions alone cannot produce the changes we need to make. Nor can we merely rearrange existing arrangements and call it change. Only by letting go of meaningless distractions and staying awake and aware can we discover and reach our greater potential and become who we really are deep inside. Yes, all this is challenging because it requires us to stretch every part of us into new dimensions just to know what works and what doesn’t. But, the way things are right now, reaching our potential is a challenge we must step up to and embrace. The enthusiasm for this already exists and is accentuated by 3’s optimistic vibrations, but that’s a roller coaster, too. Up with eagerness one day, and down the next as undesirable news comes in. Another downside is a tendency to become easily distracted by 3’s ever-changing landscape of superficial matters, gossip and hearsay. 3 exposes our own shallowness, and our tendency to connect only to what is obvious or most easily understood when, in reality, the solutions we desperately need exist on a much deeper level. But, if 3 is the number of shallowness, it is also the number of depth. It is only our fears and doubts that keep us at the shallow end of the pool. But the fact that we don’t like doubt is one of the reasons that some people with very limited intelligence are able to hold positions of power. We want certainty which, in an evolving world can only be found in frozen points of view. Their views are frozen in the fear of change, and they will go to any lengths to stop change from happening. They cannot believe in evolution because that IS change. They cannot accept diversity because that, too, is change. They are shallow in character and attitude, and cannot talk intelligently. This attracts followers who are also afraid of change, also clinging to the shallow edges of life, and also have no clue about the real workings and mechanisms of this world. Everything is related to them, personally… and the greater good be damned! In this 3 year which focuses on the power of communication, I believe that a war of words will develop, highlighting the dire importance of the correct use of LANGUAGE. What good is communication without accuracy? What good is information if we don’t understand it? What good is freedom of speech if we cannot tell lie from truth? What good is freedom of speech if everyone is talking at the same time, drowning out each other’s voices? Communication is the key to understanding, but there is going to be a massive attempt to own and therefore control the outlets of communication, such as the news media, TV, radio, entertainment, and the internet, all of which are under the control of corporations. Words, letters, shapes, numbers, sound, vibration, imagery, energy, all of these things are related to the number 3, and all of these things are being used to shape people’s minds and hearts through emotional manipulation. However, individual minds are expanding from the pressure of all this emotional movement which is resulting in an overall expansion of consciousness. Our minds are changing, becoming aware, waking up, and paying attention. Our famous ‘short attention span’ was produced by keeping people constantly distracted, but if we are to have fully functioning minds, we must balance ourselves with the truth. Our emotions – our feminine energy – is GRAVITY. It is our WILL. That’s what keeps us grounded. That is what is helping us to reject what we know – what we FEEL inside – to be false or wrong. 3 exposes hearsay, rumor, trivia and idle talk, and the tendency to believe unfounded or unconfirmed information. Conspiracy theories will be alive and kicking this year! Some will be true, and others will be mixed with just enough truth to give the appearance of being true. Remember, 3 is the number of appearances, which can be very deceiving since any appearance can be manufactured or distorted with today’s technology, and the clever use of words and images. The symbol of 3 is the triangle which is thought to be the most stable shape possible, the only symbol which, if all endpoints have hinges, will never change its shape unless the sides themselves are bent. Rest assured, a large-scale ‘bending’ will be attempted this year, but it can only be successful if we remain unaware of what is going on. 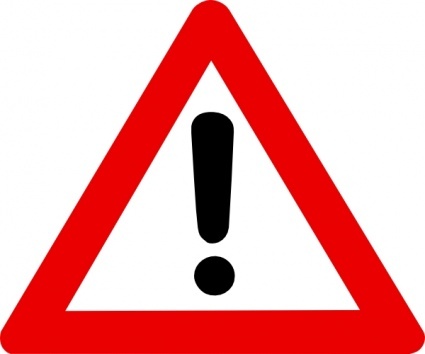 Funny how so many warning signs come in the form of a triangle. Primarily, 3 warns us: do not automatically believe everything you see and hear. Do not judge a book by its cover. 3 reflects a childish tendency to rush through things we don’t understand, skim over the details, and succumb to anything we are told will keep us ‘safe’, but this renders everything far too ‘dumbed down’ for our own good. A flood of hypocrisy will come to the surface this year for the purpose of helping us to recognize the insincerity in our own lives, with which we present a certain persona to the world that is not truly who we are. We will see a lot of reference to hypocrisy this year, along with words like ‘double standards’, ‘pretense’, ‘outright lies’, ‘two-faced’, etc. You see, there are parts of the inner child which we really do need to revive and learn from. One of them is SINCERITY. 3 is the number of popularity, and we have already seen the lengths that some people will go to in order to be popular and successful. The boy in the runaway balloon, Octomom, etc., and then there are those who give up their own freedom to be “successful”. It’s called BRANDING. Turning oneself into a ‘brand-name’ (and a name that can sell other brands for enormous amounts of money) by presenting an inaccurate image of themselves to the world. In doing so, they bind themselves to a set of rules that they cannot possibly live up to, simply because that’s not who they are. “Keeping up appearances” is a major factor of the 3 energy, and it is causing much of our day-to-day misunderstanding and stress. 1 represents the father; 2, the mother, and 3, the child. Family triangles loom large this year, as we try to understand our relationships to parents, children, siblings and relatives. Old memories return along with the feelings we were unable to process back then…… Understanding those relationships plays a large role in the ‘growing up’ process. Understanding and forgiveness are the keys. Whatever our parents could not give us in terms of parenting, nurturing, attention and love, we must now give ourselves. (See the link to FAMILY NUMBERS at the end of this page). While there is likely to be a significant focus on children in 2010, for various reasons, the childishness and immaturity among adults also needs immediate attention. However, programs, patterns and routines which were ingrained in our younger years (and were derived from previous generations) are still shaping our actions and beliefs today, and are blocking our access to what we most need to learn. This year, if we strive to untangle ourselves from old behavioral conditioning, our viewpoints, (the angles from which we look at and understand life), will start to move and expand considerably. On the world stage, we are likely to see many of the offspring of the old ‘leaders’ inheriting the positions of their parents. For some, it will be an opportunity to rectify the mistakes of the past, while for others it will be a continuation of what went before. We are now in an unstable position between the shallowest end of life which threatens to run us aground and keep us stupid, and the deeper waters which contain all the dangers and ugliness of life that we don’t want to look at, but also offer the only way forward if consciousness is to stay conscious, and if the human Will is to survive. As uncomfortable as it may be scraping along like this, we cannot leave ‘the shallows’ until we overcome the fear of what our own potential may consist of – and take ourselves much deeper! We are told not to take ourselves too seriously, and the shallow end of the 3 energy wants you to take nothing seriously at all. But these are very serious times. Reaching our personal potential MUST be taken seriously this year because we evolve collectively at the same rate that people are evolving individually. We REALLY need each other’s cooperation and encouragement to do this. We need to be friendly to one another if possible, even if we do not understand each other’s position. 3 is the number of the friend, friendship, friendliness. Governments or armies or industries cannot and will not give us freedom. To begin with, it is not theirs to give. It’s going to happen through the rising personal power, the freeing of the Will, within each individual that makes up the ‘masses’. Yes, those who want to control will do anything they can to break the Will of humanity. They always have. In the 2000s, this can and must change, but can only be done through increasing the dimensions of our awareness. It has been said that the average human uses only a tiny percentage of the brain’s capacity, and that is because the brain has been programmed to cut off from our feelings and emotions – which are our very means of expanding awareness. We cannot know what the full role of the Will is until it has been given a chance to move towards its potential and, even then, it’s potential will continue to change as we continue to evolve. Understanding the evolutionary course of the human Will can help us more easily handle the situations we find ourselves struggling with. The emotional Will which has been relegated to the lower chakras is trying to rise up to meet consciousness which occupies the upper charkas and, which until now, have been keeping the Will down. Their meeting point is in the HEART where LOVE can help them to reconcile. This is a vital part of what it takes to become ourselves, to become a WHOLE soul. It is our way forward. let your soul guide you along the way. This entry was posted in numerology and tagged emotional healing, emotions, evolution, free will, healing, karma, numbers, numerology, spirit, spiritual journey, spirituality, symbols, year ahead. Bookmark the permalink. Thank you, Christine! 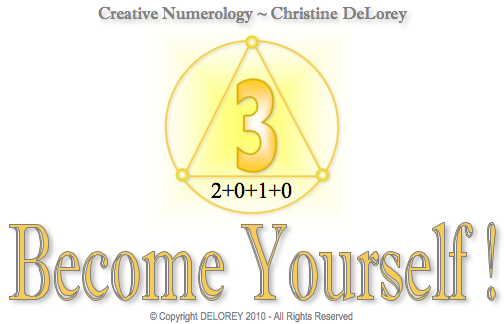 I regularly turn to my numerological forecasts and your writings for guidance. You are a bright light helping us all. Keep shining! I find your insights to be amazingly helpful (and so detailed and thoughtful). This post on 2010 as a 3 year is super exciting for me personally as I am a 3 life path in an eight year! Bring on the communication and expression! I mentioned your blog in my last blog post…www.conduitofjoy.com. Hi Kara – The combination of 3 and 8 does tend to activate the imagination, which is just what we need in the world. Wishing you a wonderful year. Right on target my dear!